A computer games designer creates a virtual reality experience which blurs fiction and reality. 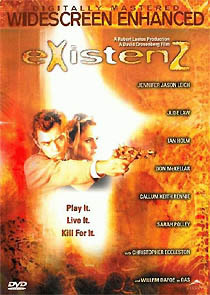 eXistenZ is an immersive video game using state-of-the-art biological computers which are connected to the players via “bioport” orifices at the base of the spine. At the launch it’s hotshot designer (Leigh) is attacked, and she is forced to flee with a naïve marketing executive (Law). With its thematic echoes of Videodrome, and the stylistic feel of Naked Lunch, it’s clear that director David Cronenberg is on familiar ground. The plot could easily have been lifted from a modern episode of The Outer Limits, but its intimate obsessions are clearly those of the man who practically invented biological horror movies. Frustratingly, the film works like a ninety-minute joke with a five-minute payoff at the end, but its images and themes have resonance, and raise interesting moral questions. The UK disc presents a number of extra features that aren’t on the US version, including three full-length commentary tracks (by Cronenberg, cinematographer Peter Suschitzky and visual effects supervisor Jim Isaac), and a 53-minute documentary, Frame By Frame: The Invisible Art of Production Designer Carol Spier, focussing on the most creative aspects of the production process. (It’s rather crassly labelled an “FX documentary” on the menu). The documentary, which effectively functions as a “making of…” feature, also includes behind the scenes footage from Naked Lunch, clips from a couple of other Cronenberg films and an alternate trailer introduced by the director. Cronenberg features heavily in the documentary, but the director’s commentary track is invaluable for unravelling his intentions. The other commentary tracks are less essential, but offer a lot of useful information, and more insight into Cronenberg’s working practices. The disc, from Alliance Atlantis, presents the film in 1.85:1 ratio, in a virtually flawless transfer. The Dolby 5.1 sound is used effectively, but showy scenes are sparse. The UK disc looks terrific, but for the ultimate presentation, seek out the Canadian Region 1 disc, which contains all the supplements of the UK disc, an extra trailer (in French), and a 16:9-enhanced transfer.